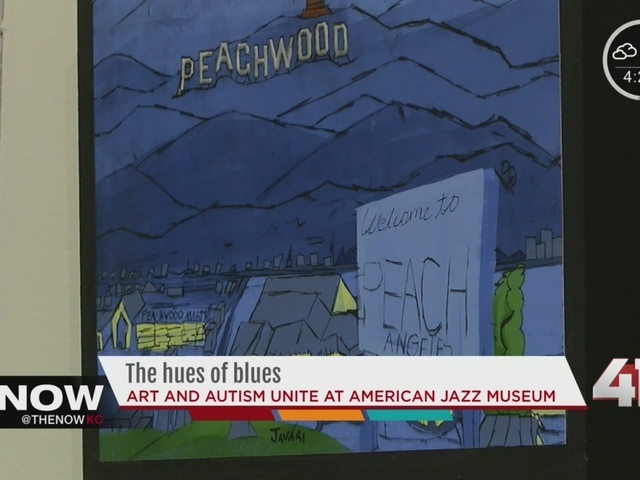 Autism, art and music: a three-way intersection that meets at the American Jazz Museum from January 14 through April 30. The exhibit is called Spectrum and features the art of Juliette Hemingway. This display has as much or more to do with Hemingway’s role as mom than as an artist. Hemingway’s 13-year-old-son, Javari, is a person living with autism. He has been drawing since he was two, and Hemingway realized early on that art was a way to connect with him. Blues, both the color and the musical genre, consistently arise in Hemingway's life. "It's almost like a bottomless pot being poured out and I am just pouring it into my work," said the Denver-based artist. "I am never empty of that. I hope I never am." She started using hues of blue early in her works of digital art. Often times the faces she creates are blue. She said she chose the color because it was a way for people to connect with her art without seeing race. Then her son Javari came along and the color took on a new meaning. "Blue is a symbolic color of autism, and because it is ever present in my life it is therefore ever present in my art," she explained. "As an artist I think your work is always reflecting what is going on in your world so that's what's happening here." Hemingway uses different hues of blue in her work so exhibit visitors will see past race. Now Blues has transformed her art once again through the American Jazz Museum's latest exhibit. While Hemingway created most of the art on these walls there is a second artist whose work is on display. For the first time ever her son's artwork hangs right next to his mother's. "The arts in general is a way for anyone, whether they are on the spectrum or not, to communicate to get rid of that stuff that sticks to our souls on a daily basis," said Hemingway. "Especially for autistic kids, it's a way of getting into their world." Now Hemingway hopes her temporary exhibit brings together the community, just like it did for her and her son.